As one of the world’s oldest football associations, a long and proud football heritage rests on the shoulders of the Dutch players. This year marks the 125th anniversary of the Dutch FA., which makes them the second oldest on mainland Europe, only beaten by the Danish. Earlier this month Nike launched the Holland home-shirt and now it’s the away-shirts turn, making sure The Oranje are ready for Brazil this summer. 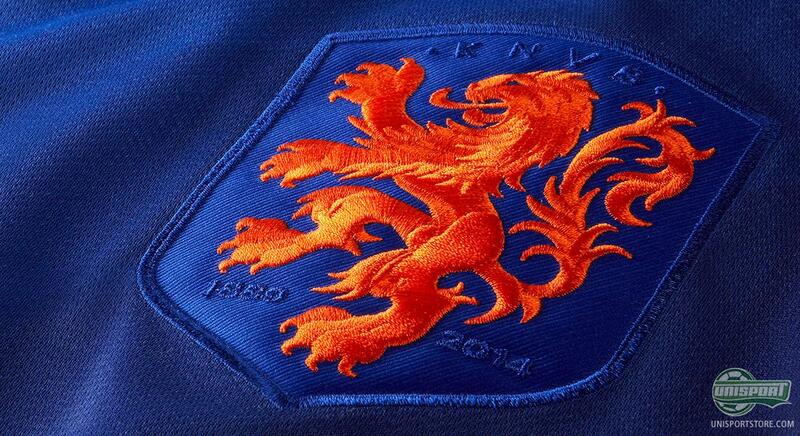 The World Cup in Brazil will be the 5th time Holland will wear Nike at a World Cup. Their partnership doesn’t stretch as far back as the Dutch F.A.’s existence, but none the less Nike have gone to great lengths to celebrate the Dutch heritage and football spirit. The home shirt was of course made with the traditional orange colours in a classic design and they have gone along the same lines with the away-shirt. 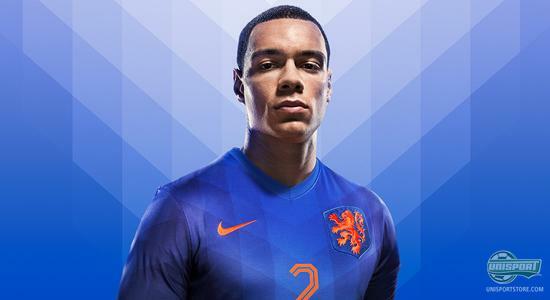 You can already now pre-order the new Holland World Cup away-shirt – just €78. 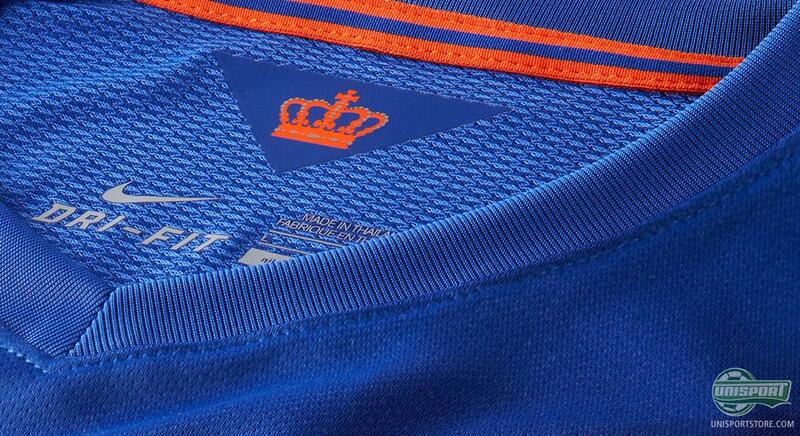 Holland’s away-shirt comes in a graduated regal blue colour and therefore reflects the proud royal culture, which is so meaningful to the Dutch people. Nike have therefore also redesigned the KNVB’s logo, which beautifully contrasts the royal blue colour, with the famous orange. The shirt has a sharp geometric watermark pattern, which gives the otherwise classic design a cool edge. The collar is made with a classic V-neck and like the home-shirt it honours the Dutch football heritage, which has brought us superstars like Johan Cruyff, Macro van Basten and Dennis Bergkamp. 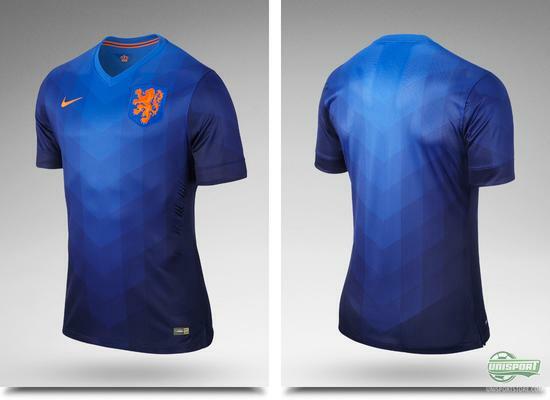 Like the other World cup shirts from Nike, the Dutch away-shirt is also made from the American brands Dri-Fit material, which helps divert sweat and moisture away from the body. Nike have also used many of their other innovative technologies, like their advanced 3D scanner, which allows them to make a shirt with the perfect athletic fit. If you want to show your support for the Dutch during the World Cup, then you can pre-order the shirt here – just €78. When van Persie and co. step onto the Brazilian pitches this summer, it will be with an unquenchable thirst for gold they bring with them. Oranje came agonisingly close in 2010 and they would love to celebrate their 125th anniversary with a World Cup title. With this new away-shirt they are certainly fitted with the right equipment for the task. What do you think about the new royal blue away-shirt?